Do you own a horse in your house? Are you having trouble trying to relieve its stress or calm it down? We got your back! Keep reading. Although there are some natural ways to comfort your horse, adding some supplements to its food is the most simple method. After reading this article, you can safely use the best calming supplement for your beloved horse. Let’s start by learning about our list of recommended products. How to choose the best calming supplement for horse? Is it necessary to use a calming supplement for your horse? In which ways can calming supplement help your horse? Do you know when to use the calming supplement? Is it time you need to use the best horse calming supplement? 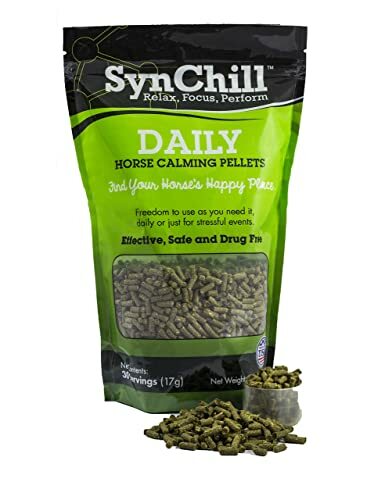 Topping the list is the new product of SynNutra, the SynChill Daily Horse Calming Pellets. According to the manufacturer’s introduction, you can “find your horse’s happy place” with this product. The product is developed and used by equestrian veterinarians. At the same time, it complies with FEI standards, so it does not contain drugs or banned substances. Thus, your horse can safely relax without sedation. SynChill daily also combines L-theanine to help relieve anxiety independent of serotonin production in the brain. Its main ingredients are dehydrated alfalfa meal, threonine, molasses, oxitriptan (Griffonia seed extract), pyridoxine HCl (Vitamin B6), and melatonin. It is provided in a good alfalfa tablet, in a vacuum-packed bag of 30 servings. The product is suitable for reducing horse anxiety and stress with the unconditional guarantee from the manufacturer. Recommendations from the manufacturer are 1-2 scoops a day, 1-4 hours before stressful events. This product effectively reduces stress on horses. You can use it daily or before stressful events. It helps improve the horse sense and relationship between people and horses. This supplement does not contain harmful substances. The price may be quite high. If you want a complete support for three processes leading to a balanced central nervous system: serotonin, nutrition, and relaxation, we recommend the Formula 707 Daily Fresh Packs Equine Supplements. What can you expect from this supplement? This product contains beneficial ingredients including L-Tryptophan supports the supply of serotonin to reduce anxiety; Thiamine (B1) helps nutritional deficiencies and metabolism; Magnesium is for muscle calm and relaxation. You will have one pack per day that is pre-measured accurately, so this product is convenient and easy to use. This product is fresh in a sealed package to prevent oxygen, moisture, and sunlight. You can bring it to use for events or daily use in the horse’s diet. With horse support experience from 1946 by John Ewing Company (USA), the product has high reliability. You can feed one pack daily to a horse of an average 1100 lb. It is a useful product in convenient packaging. Products that help reduce stress, muscle tightness and calm horses. It has an apple flavor which your horse loves. This product is not shipped outside the United States. A product from the famous REDMOND brand helps horses heal and improve the food digesting process. 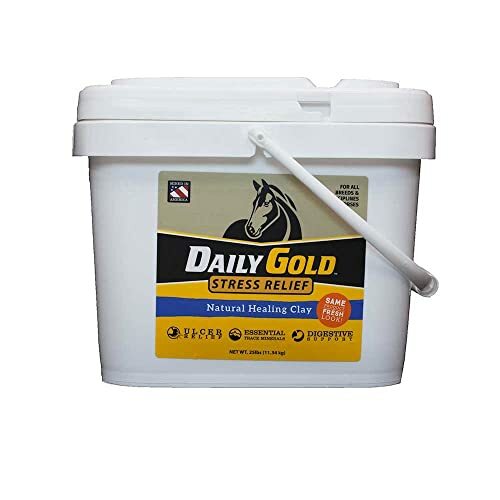 You will want to own it right away, the REDMOND Daily Gold Stress Relief, Natural Healing Clay for Horses. Let’s learn about its great features. You will have a completely natural montmorillonite clay containing 68 minerals and 3% sodium chloride. You can find the same 68 elements from the tissues of animals and humans. It helps support digestive problems with unique molecules and high pH. Because of a broad spectrum of minerals, feeding with other supplements is safe. Normally you use two scoops a day to add into horse food and three scoops if your horse works hard or needs to reduce intestines and digestion. This product is for various purposes such as the relief of stress, ulcer, colic, and trigger for hydration, toxin binding and digestive support. It helps to put your horse on a healthily balanced stomach pH. The supplement also adds many essential minerals for horses. It offers many common health benefits, including increased energy, improved digestion, healthier hooves, better hydration, and stamina, etc. Your horse may not like the taste of this clay. If your mare has tough cycles, sullen or irritable attitude, you’ll need this product, the Mare Magic. As its name suggests, your horse is promised a happy time. Which “miracle” does this product bring to your mare? Products containing dry raspberry leaves help reduce the effect of hormonal changes in your horse cycle. 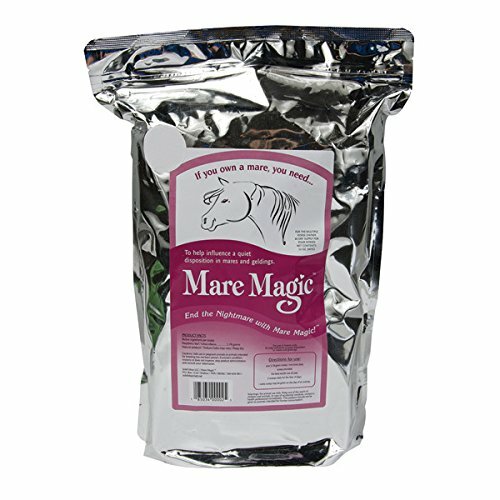 Mare Magic is an entirely natural and extremely palatable herbal supplement. You can also use it on geldings, it is not recommended for pregnant mares though. The manufacturer suggests using all year round for the best results. And it’s great when the 32 oz package offers a horse up to 240 days. With the first feeding, you use two scoops a day for the early ten days. Then you use one scoop to feed once a day. Products help your horse calm and relaxed. Your horse will eat right away with this supplement with delicious taste. This fantastic product has no side effects or harms. It tightens the uterus and helps the reproductive tract of mares. You can use it for a long time with 1 package. It may affect bowel movements of a horse. A product from the Oralx Corporation brand helps to ease anxiety and irritable horses daily. 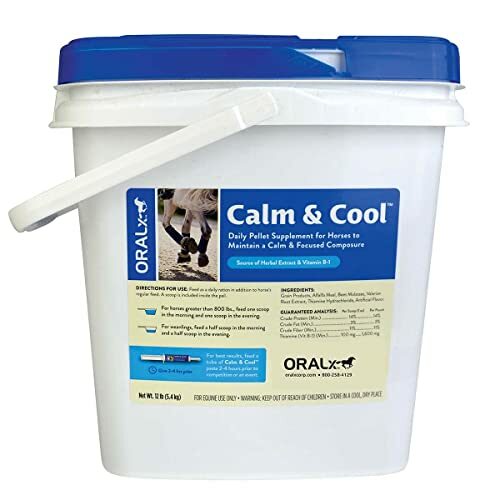 We suggest you to use the Oralx Corporation Calm and Cool Pellet for Horses. What benefits does this product offer? This supplement contains essential L-Tryptophan Amino Acid and natural herbs. 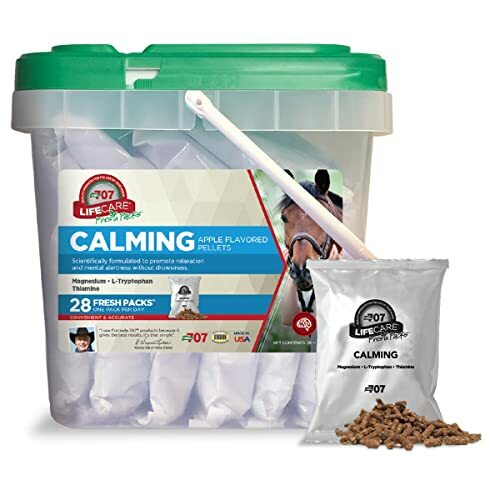 You can use this product to assist in calming anxious and excitable horses. It also relieves the nervous feeling of your horse for more effective training and performance. The product is in a convenient 12-pound pail. You can feed your horse one scoop (1 ounce) in the morning and one scoop in the evening every day. Remember to use half scoop twice a day for weanlings and 2-4 hours before an event or competition. It helps your horse calm, cool and rideable. Products with natural ingredients are not harmful. The dosage may vary flexibly depending on the intended use. This product is easy to use and delicious for horses. Results may vary by horses. Well, are you still with us? Now you have a list of the top 5 best products on the market. Let’s explore other useful information about this product. Horses are animals with personality, emotions, and reactions, so situations like traveling, playing and moving facilities can make them stressful or anxious. That’s why you need to use a supplement to calm the horse. When your horse is worried, it will be difficult for you to handle, train and ride it. In worse cases, the animal may have dangerous behavior, which can injure itself or you. Therefore, we give you some notes to remember when looking for the best horse calming supplement. Although you know there are many supplements with a calming effect, take a closer look at the package and read the ingredients. Then, you can quickly decide which one is best for your horse. Moreover, you need to rely on the results of clinical trials, not smart marketing. It is necessary when you are unsure about the type of supplement you should use for it. Chrysanthemum, ginger root, valerian, passionate flowers, and black cohosh may have excessive sedative effects, interacting with other drugs and cause side effects. When your horse has behavioral problems, check to see if it is hungry. At that time, animal foods (hay and grass) should be available for you to feed your pet when needed. It can also indicate a link between the horse’s stomach disease and its rebellion, which is something you should keep in mind when you can use digestive support supplements to calm your horse. It is involved in the transmission of nerve impulses and is a useful ingredient to reduce anxiety. But when you add too much magnesium to your horse, its calcium metabolism will be affected. Therefore, sufficient dosage is essential. It can make your horse calm and relaxed. You should note that low tryptophan doses can cause mild excitement and higher doses may affect horse performance. You should take the right treatment to ensure efficiency. Also, B vitamins are also involved in the production of serotonin, which is why they are often present in supplement with tryptophan. However, no clinical trials have shown that vitamin B is effective in reducing horse anxiety. It is extracted from a tree of the same name, which can calm your horse. Sometimes it can be used in human sleeping medicine. If you have a horse to join a competition, you need to provide a valerian-free horse supplement because it is on the Federation’s list of prohibited substances. This microorganism has an acidic effect in the back intestine, thus reducing anxiety for your horse. It is beneficial for the following environment and improves the acid-base balance. There are many ways to calm your horse and putting supplements into food is one of them. Every decision is up to you. Therefore, our advice to this question is that you should talk to your veterinarian or horse nutritionist before adding new products to your horse diet. You will have specific brands or formulas that suit each situation of your horses. Especially when your horse is performing or competing, you also need to be careful with ingredients on the banned list. As we mentioned, the composition of the supplements is very different. Magnesium plays a role in muscle and nerve function while chromium minerals help regulate blood sugar and Thiamine (vitamin B1) supports the nervous system. Traditional herbal calming substances are also commonly used, although they can help some horses, not all. They are chrysanthemum, valerian roots, raspberry leaves, etc. Yes, you do. As a long-time rider, you certainly know when your horse has a problem. They are the times when your horses move to another stable, on a trip, in an event or competition or the mares have cycles. You can see that your horse is hot, jumping, hurting themselves, giving up eating, painful, nervous, etc. You have to take note of all the symptoms to inform the veterinarian. Now you need to find the right solution to help your horse reduce stress, reduce pain and live more comfortably. Whether or not taking supplements as a treatment method depends on you and the experts’ opinions about horses. With the experience of raising and caring for horses for a long time, we choose to use this product for our horses, the Formula 707 Daily Fresh Packs Equine Supplements. The reason for our choice is thanks to expert opinion from veterinarians and nutritionists. Our horses can reduce stress, muscle tightness and become calmer. This supplement is a useful product in convenient packaging. And we believe in this long-standing brand. You can quickly check the health condition of your horse with some experts and buy the right calming supplement immediately. Ask us if you have any questions in the comment section below.